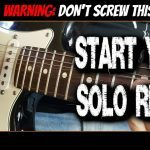 In this guitar lesson you’ll discover 3 alternate picking licks for building speed and using in your solos in the styles of players like Paul Gilbert, Gary Moore, Yngwie Malmsteen, Zakk Wylde and others. All 3 licks are in the key of A minor using a mixture of different minor and blues scales. Alternate picking lick 1 is in the style of Gary Moore and Randy Rhoads. Not only is it a great alternate picking lick to use in your solos, but it’s also an awesome exercise to build you picking speed and chops! Alternate picking lick 2 is in the style of Yngwie Malmsteen and uses the A harmonic minor scale. 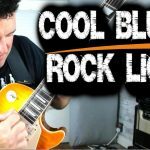 Check out the scale pattern, then jump into this challenging alternate picking lick, it’s an amazing speed building workout! Alternate picking lick 3 uses string skipping, the A blues scale and some notes from the A Dorian mode. It’s the kind of alternate picking lick you hear Paul Gilbert play in his solos.